The Swiss are known for their excellence in the art of making fine chocolates. Chocolat Frey has been creating luscious confections since 1887, and now they are coming to the United States. Chocolat Frey is the number 1 chocolate brand in Switzerland. Founded by brothers, Robert and Max Frey in 1887, for more than 125 years, Chocolat Frey has consistently produced quality chocolate. Being a company that values sustainability, Chocolat Frey® is UTZ certified. They practice environmentally positive methods that support sustainable farming. This, in turn, helps the farmers and their families by providing better opportunities. Chocolat Frey has honed their processes, so that their customers are assured that their purchases will be the best of the best. This Spring/Easter Season, give the gift of great chocolates to those you love. Start out with some adorable bunnies. Meet Sunny, Funny and Luck! Meet Lucky, Sunny and Funny, the Chocolat Frey Bunnies. Chocolat Frey chocolates are absolutely delicious. My family scarfed it up almost as fast as I unpacked my box of goodness. It’s smooth, creamy and filled with flavor. I find that I can eat smaller portions and be more satisfied, than I am with larger portions of the typical “over the counter” chocolates, that are on the shelves at this time of year. Chocolat Frey chocolates will be available in a number of varieties from minis to a large boxed assortment. Chocolat Bunnies – These cheerful shiny bunnies will be a hit with EVERYONE! Doesn’t this plate full of goodness just make your mouth water! Connect with Chocolat Frey North America on Facebook, and then head out and get some Chocolat Frey chocolate. You’re in for a TREAT! But before you leave, enter for the chance to WIN a Prize Pack Combo: Everyday & Bunny Pack ($50)! After entering here, check out the other 24 blogs that are also offering this fantastic prize package. That is a LOT of chances to WIN! St. Patrick’s Send them out the door ready for a great day! I love the bright pink bunny because pink is my favorite color. I’d most like to receive the Dark Crunchy Nuts 6.3oz Bar because I love chocolate with nuts,. I’d love to try their Chocobloc Orange. I just love the combination of chocolate & orange! My favorite bunny is Funny Bunny! I love that bright blue! It reminds me of Aegean blue, my favorite color. I like the Swiss Milk Chocolate Bunnies for Easter for the kids. I like Lucy bunny for she is a pretty color and good for the kids Easter baskets. I really want to try the Dark Crunchy Nuts! I love chocolate and hazelnut combo! I would choose the white chocobloc white. White chocolate and raspberries are my favorite combination and I have a feeling that I would really like this chocolate. I would like the pink Frey chocolate bunny because pink is my daughter’s favorite color. I’m most likely to choose the Frey’s mini Chocobloc Dark because I am a fan of dark chocolate. I would choose the Funny Bunny because it’s my favorite color. Dark chocolate and hazelnuts give me life! Even though all of the candy looks delicious, I have a special love for dark chocolate. Thankfully, there is a lot of that to choose from! I’ve always preferred milk chocolate and milk chocolate with nuts is my favorite, so the Milk Crunch Nuts bar would be my favorite, but I wouldn’t turn any of them down. I would select the Mini Chocobloc Assorted 5.3oz Stand Up Bag. That way I could get a taste of many of the Frey products. I like the Lucky Bunny. Green colored for the luck of the Irish. I would love to get Milk Crunchy Nuts bars since I think there is nothing better than chocolate covered nuts. I would like the chocobloc white because my daughter loves white chocolate. I’d like to try Milk Crunchy Nuts because I love milk chocolate and I also love nuts especially in chocolate! I would get the Mini Chocobloc Assorted to share with my sister. I would like the Sunny Bunny because pink is one of my favorite colors. I’d like the Mini Chocobloc Assorted 5.3oz Stand Up Bag because it has all of the flavors! Oops I didn’t realize it was a different page! LOL I like the pink Sunny bunny because it is dd’s favorite color and she’d love to find it in her Easter basket! My word..so happy they have come to America! We are chocolate lovers..but only premium chocolates from either Swiss or Belgium..nothing better. This is why I would give or love to receive. I would love to give my husband the Milk Chocolate Crunchy Nuts variety. He loves nuts wrapped in chocolate. My daughter would like Sunny, because of her color. I would most like to try the assorted pralines. I would share the Mini Chocobloc Assorted 5.3oz Stand Up Bag. The green Lucky bunny is the best. I would love to try the Chocobloc White Bar because boy does it sound good! I love white chocolate, I do love milk chocolate too though. I would like to try the Chocobloc Orange 3.5oz Bar because I love that combination of flavors. Mini Chocobloc Assorted is perfect so everyone is happy! I like Sunny bunny because it is my favorite color. I would love the Chocobloc White 3.5oz Bar, I would make White Hot Chocolate! I would choose the Chocobloc Dark 72% because I love dark chocolate. I love it 72% more than Kanye West. I would pick the green Frey Bunny because green is my color. I’d like to try the Chocobloc Orange most because I love orange flavored chocolate. I would love to try and give this Chocobloc Orange 3.5oz Bar for my family and friends because I think this flavor is great! I would love to try the Lucky bunny because of its name and color! I would like to try the Chocobloc milk or dark because I love Toblerone and it looks similar to Toblerone. I would like to give the Frey bunnies to my kids for Easter because they’re adorable. I would love that Lucky bunny because I just love that green color! I’d love the Sunny bunny for my husband, Funny bunnys (larger one of course) for my sons, and the Lucky Bunny for myself. Thank you for the review and giveaway. I’d like he pralines for my husband, everything else for my sons, and orange for myself – I love that combonation. I’d also love the milk choc nuts. I want Sunny The Bunny. She’s pink, The best color, She’s sweet and adorable. HUNGRY! I’d like to try the Chocobloc Orange because those flavors go so well together. I like Lucky Bunny because it’s the color of Spring! I would love to try the pink bunny, Sunny lol. I love all things pink! I like dark chocolate bar with nuts but any kind of chocolate is great. If I had to choose just one it would be the ‘chocobar dark’….there is nothing better than dark chocolate to satisfy a sweet tooth! I would love to win the chocolate Sunny Bunny for my grandson as that is our grandson’s name and I think he would get a kick out of that! I need bunnies for the kids!! We would like to have the green one because my grandson loves green. My sons favorite color is blue and I would love win a blue bunny for his Easter basket. I would love the Blond Crunch Almond bar! Love white chocolate and almonds, and have never had them together – sounds wonderful! I would give the Dark Crunchy Nuts to my husband because he loves dark chocolate and nuts. I would like the Sunny Bunny because I like how cheerful the pink color is. I’d like to receive a blue bunny to give to my son because he loves blue and I know he’d appreciate it. I love the Dark Crunchy Nut bar. I would like to try their Chocbloc White Chocolate Bar. I have never tried this brand before and it looks delicious! I would choose for my grandson the Blue Bunny(Funny) to put in my grandson’s Easter Basket. I would love to try their chocobloc dark 72% it looks delicious and dark chocolate is good for you. I want to try the Chocobloc Dark Chocolate Minis. I love dark chocolate the most, and the minis are the perfect size to indulge a little with. Chocoblock Orange would be my kids pick as they love those chocolate oranges. Any of the chocolate is the best. I am not picky for chocolate. I’d want the Chocobloc Milk 3.5oz Bar because chocolate and almonds are my favorite combination. I would like the blue bunny funny because blue is my favorite color. I would like to try the Assorted Pralines, they look so good. I’d love to try the Mini Chocobloc Milk 5.3oz Stand Up Bag, because Milk chocolate with almond honey nougat is my favorite! I love the green Lucky bunny. It is pretty colored, and I need luck! I would like the blue bunny because my daughter always calls herself a funny bunny. I’d like to give my husband the crunchy blonde almond candy because he enjoys white chocolate. My grandkids would love Lucky the bunny. I would choose the green bunny because it is the color of Spring. 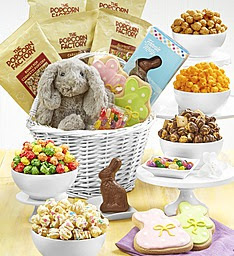 I would love to get the Chocolat Frey Bunnies for my Granddaughter’s quilted basket I made for part of her Easter gifts. She will love the bunnies, they are so pretty. I’d love to receive the Green Lucky bunny. Green is my favorite color and I can use him in my Easter display on our table until I couldn’t resist anymore. I would select the Mini Chocobloc Assorted 5.3oz Stand Up Bag so I can try the different flavors. I want the Lucky bunny cause green is my favorite color. Blond Crunchy Almonds 6.3oz Bar it just looks good. I would like the Funny Bunny because it’s blue. I like the assorted pralines! They are my favorite! 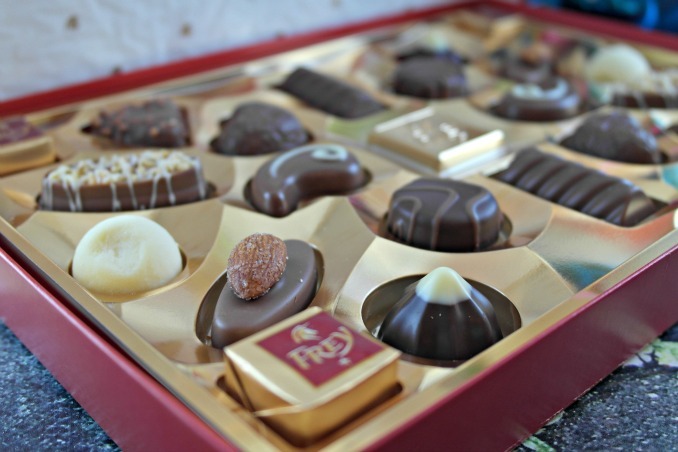 I would love to get the box of Assorted Pralines because I love a variety of chocolate tastes. Some of my favorite colors are in the blue family so I would pick for myself the blue bunny. I would like to give my son theBlond Crunchy Almond Bar because he loves almonds. I like the Pink Sunny Bunny because I love pink! Why is this suddenly 20 days away not today? The other giveaways ended on March 3. Are you leaving your open for 16 more days? Why did you pull the contest early? I wonder when will chocolate frey available in Indonesia? Is it a premium chocolate? Better than cadbury? I just discovered the dark chocolate bar with whole! (not ever in USA) hazelnuts (Dark Crunchy Nuts 6.3oz Bar) and my store told me it is being discontinued. Is there a way i can continue to buy this? Perhaps from Switzerland?